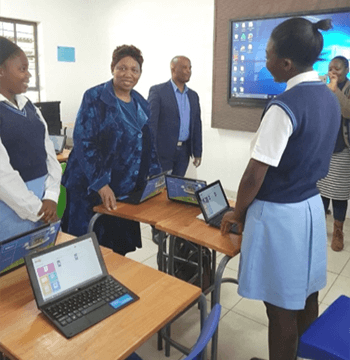 The Telkom Foundation launched the Connected Schools project (CSP) in July 2017 when it pledged over R 200 million for a five year programme to contribute towards improving the quality of teaching and learning with a specific focus on Mathematics, Science and English in disadvantaged communities. The programme is being rolled out in the Eastern Cape and Gauteng Provinces. SchoolNet SA is responsible for all teacher professional development activities as well as the capacity building and management of an intern programme that sees a technical support intern allocated to each school. Telkom included a Supplementary Programme to support Grade 8 learners through to matric to improve the quality of their pass rate. This programme includes a focus on the psycho-social element, which aims to sustain the learners’ performance through support and understanding the effect their home environment can have on their academic performance and life skills.